Follow The Line Follow The Line is a nice relaxing game, all you have to do is Follow The Line. 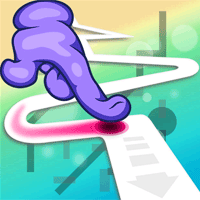 Move the red circle through the endless up-scrolling screen, avoiding the black walls and see how far you can get. Just lay back, enjoy the music and try to beat your high score. Have funand good luck.